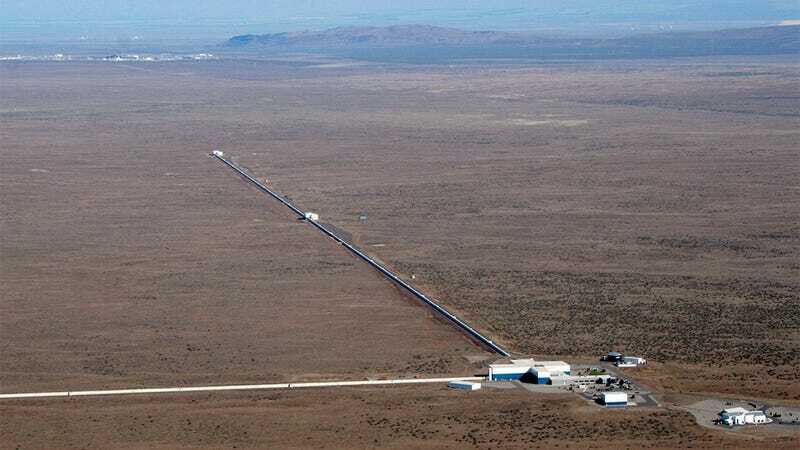 The LIGO and Virgo gravitational wave detectors are set to resume their hunt for gravitational waves on April 1. This go-around, they’ll be even more sensitive thanks to a set of upgrades to their lasers, mirrors, and other components. This next run will be a big deal—for different reasons than the first two observation sessions. We’ve officially entered an era in which two black holes slamming together in an unfathomable collision that sends ripples through spacetime itself—ripples that we can actually detect—is “routine.” But scientists aren’t worried about most of the individual collisions anymore. Instead, they’re interested in the behavior of our Universe more generally—about how black holes can end up colliding, what kinds of places in the Universe are home to these sorts of black-hole-slamming environments, and whether black holes grow through a sort of chaotic family tree of mergers. Quick recap: Albert Einstein first theorized that gravity should travel at the speed of light as waves rippling through space (and time) itself. After decades of dedicated searches, scientists finally announced in 2016 that they had spotted the ripples created from a pair of colliding black holes using two several-kilometer-long, L-shaped tunnels, each with a laser beam passing through. Special mirrors split the laser beam in two, sent the pieces through either wing of the tunnel, and reunited them onto a detector. The detector sensed the incredibly small ripples in spacetime via the lasers moving in and out of phase with one another. The detectors have now measured 10 instances of black holes collisions and one instance of two neutron stars, incredibly dense objects around the mass of the Sun but the size of a small city, slamming together. But merely sensing gravitational waves is no longer the most interesting piece. Now, these detectors essentially serve the same purpose as telescopes, but measuring gravity instead of light. Scientists have all sorts of questions; for example, what kind of environments have ripe conditions to bring two black holes close enough that they collide? There are two competing ideas, and either (or maybe both!) could be right. Perhaps pairs of black holes form from binary stars that both collapse into black holes. Or perhaps there are regions in space dense with black holes where they’re close enough such that they can collide. Astrophysicists can infer whether the black holes’ spins were aligned or misaligned during a collision based on the resulting gravitational waves, a stat that could help them figure out how they formed. A related question is whether black holes grow. The most recent data dump from the gravitational wave detectors came with a black hole called 170729, which is 80 times the mass of the Sun and larger than is known to be possible from a single star collapsing. This has made researchers wonder if black hole mergers are merely part of the lifecycle of black holes—do black holes have family trees and continue growing and doubling in size as more mergers take place? A recent paper from Northwestern University graduate student Chase Kimball, as well as Berry and Vicky Kalogera, tried to determine the odds that GW170729 was actually a second-generation black hole, the result of two mergers, assuming that there are globular clusters with lots of black holes living together. Their result: It’s possible, but more data is needed. And that’s what makes the restart of the U.S.-based LIGO and the Italy-based Virgo restart so exciting. “We’re inferring the total population of black holes based on 10 binary black holes,” Kimball explained. “I’m excited because if this is what we’re able to do from 10 black holes, [on April 1] the third observing run is going to start and we’re going to be observing many more.” Scientists may see as many as 40 black hole collisions during that run. If you think about it, we’re extending our understanding not just of black holes, but of stars themselves. Stars, once they’re reached the end of their lives as bright, nuclear-fusion powerhouses, might not just wallow as dim stellar corpses—they could enjoy rich, dynamic second lives as merging and growing black holes. It’s hard to say. “This part of massive star evolution hasn’t been observed before,” Maya Fishbach, graduate student at the University of Chicago, explained to Gizmodo. She agreed that the only way to answer these questions is with more events. Where do the scientists get the idea they’ll see so many more events? Well, the latest observing run will let scientists see three times more of the Universe than the last observing run, Will Farr, astrophysicist at Stony Brook University and the Simons Foundation Flatiron Institute, told Gizmodo. Not only could that bring dozens more events, but there might be surprises that researchers didn’t expect. There might also be more neutron star mergers, which would help us better understand the origins of elements like gold or the mysterious bursts of gamma rays scientists sometimes detect. Whatever happens, it’s going to be exciting, and we’re eager to see the data start coming in.